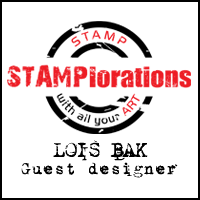 Stampin'B's Challenge #39 - Happy New Year! 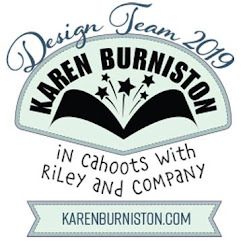 As hostess for this week's Stampin'B's Design Team challenge, I decided that in honor of the new year, we should celebrate both OLD and NEW. So my challenge was to use your oldest stamp with your newest tool or embellishment. Stampin’ Up’s Fishy Friends was the very first stamp set I bought, and I still have a warm spot in my heart for those cute little aquatics. My newest “tool” would be the octagonal nesties. I decided to make a framed project rather than a card. The octopus is stamped on white cardstock and colored with Copic markers. After cutting out the image and the two mat pieces with the nesties, I mounted them on some DP that looks like water. 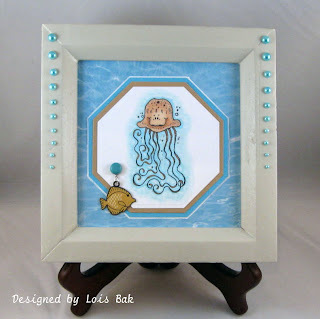 To create a “break” between the turquoise layer and the water, I outlined the octagon with a white gel pen; and to add a little whimsy, I attached the fish charm with a brad. The frame is probably older than the stamp because I found it in a bag of wooden frames that my mom had in her closet when I cleaned it out about six years ago. I spray-painted it and added the half-pearls. Do they look like bubbles? I hope so, because that was the look I was going for! I’m going to give this to a girl in my office who is pregnant. She told me she was decorating the nursery in the theme “Octopus Garden.” I think it will fit right in. 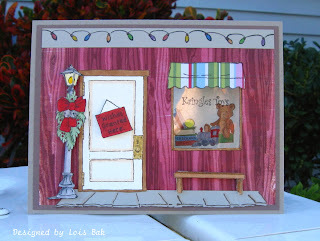 NancyRuth was the hostess for this week's Stampin'B's DT Blog Challenge. I bought this candle/bible stamp last year at a stamp show and have no idea who made it. But I really like the stamp; so, when NancyRuth wanted us to make a card using candles, it was my first choice. I wanted some white space around my music background, so this card is 5 ½ inches by 8 ½ inches. It’s hard to tell, but the Christmas Music background is stamped in gold pigment ink and embossed. After tearing the edges, I sponged on some Palette Cognac to give it a little distressed look. The candle/bible image is colored with Copic and Prismacolor markers, cut out and popped up with dimensionals. 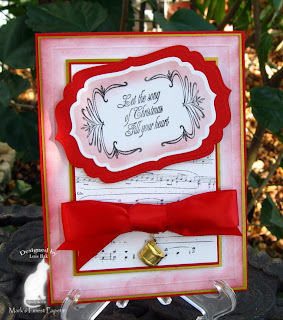 The sentiment, which is part of the Flourishes Christmas Music set, is stamped in Palette Noir Black, cut out with Petite Oval nestabilities and matted in red. I sponged some more of the Cognac ink on the white panel. All Flourishes images and Palette inks are available at Mark's Finest Papers. I just purchased Flourishes' Calendar sets -- there are three of them, four months/flowers in each set -- and have completed a Christmas gift for my friend. I bought a little $1 calendar at Michaels for the "calendar" portion and used the Flower of the Month on the top portion. I actually made two calendars -- the other one is for my sister. That one is more horizontal. 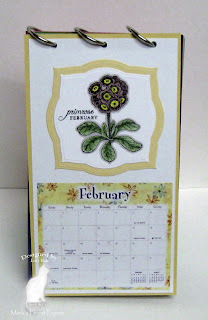 I coordinated the cardstock color with the design on the calendar, not necessarily the flower of the month. January's crocus, however, was a good match all the way around. The flowers are all colored using Copic markers and cut out with Spellbinders Labels Three. I have to admit that I needed to Google "primrose" for February. I've never seen a primrose before. When I heard the name "primrose," I thought it was going to look like a rose. NOT! After I did all my coloring and gluing, I punched the holes at the top with my Crop-a-dial and used binder rings to hold the calendar together. 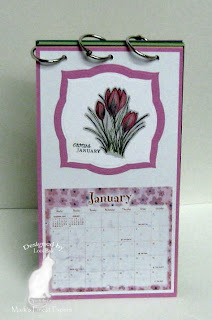 Because the cardstock is sturdy, the calendar will stand up by itself. I didn't need any kind of holder or frame. This was a fun project! All Flourishes images, Palette ink, and cardstock are available at Mark's Finest Papers. Faith (Markie's Mom) is the hostess for this week's Stampin'B's DT Challenge, and she wanted us to make a card using a beverage. I’m a tea drinker, so I immediately thought of tea! I stamped the stacked tea cups from Flourishes’ Christmas Tea set with Palette Noir Black onto MFP Snow Storm Smooth and colored it with Copic markers. I cut out all the panels with Nestabilities Labels Eight and sponged with Palette Landscape before taking the die off the paper. I didn’t want to cover up the image with ribbon, so I used some gold cord to tie a bow; and added a little teacup charm. I matted the teacup panel and Basic Grey Eskimo Kisses background with MFP Spring Leaf. All images, cardstock, charm, and inks are available at Mark’s Finest Papers. 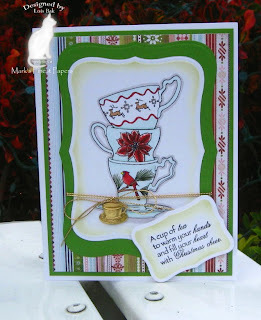 Today is Day 2 of the very first Mark's Finest Papers DT Blog Hop. For your chance to win some exciting Blog Candy, visit and comment on each of the design team members' blogs for both yesterday and today. Then, on Friday, a winner will be chosen from those who have visited all 7 blogs both days. The winner will receive 2 BRAND NEW Stamp Sets, 5 packages of Mark's Finest Papers and 5 Satin ribbons! And remember, Friday night will be the New Flourishes Release at Mark's Finest Papers! The winner will be announced on the Mark's Finest Papers Blog on Friday. I decided I wanted to do something other than a card today, and one of the new Flourishes sets contains images of teacups and accessories. 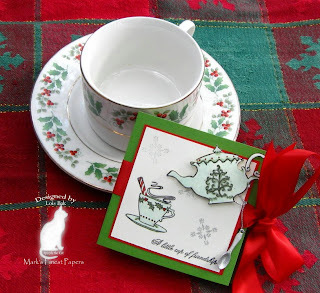 So I thought I would make a tea bag holder, using the tutorial in the Resources section of Splitcoaststampers. The base of the tea bag holder is MFP’s Spring Leaf. I made my own DP for the inside with several of the stamps from Flourishes’ Christmas Tea set, coloring them with Copic markers. I didn’t want the silver snowflakes to overtake the images, so I did not emboss them – just stamped them with silver pigment ink. The front is stamped similarly to the inside DP, but I popped up the teapot and added a spoon charm. It was originally brass, but I pushed it into the silver pigment ink and sprinkled it with Detail Silver embossing powder. 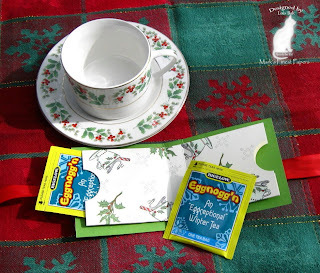 I thought the eggnog-flavored tea was perfect for a Christmas cup! Make sure you check out the cards from the rest of the DT and comment on each Blog for your chance to win all the goodies! 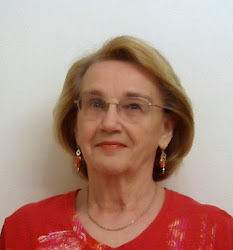 The hostess for the Stampin'B's DT Blog challenge this week was Joanne (jojot). She wanted us to make a tri-shutter card, which actually was quite fun. You can use up lots of your scraps on a card like this. The base of my card is Not Quite Navy and the scraps come from various Christmas paper pads. I want to say that they are probably all by DCWV, but don’t quote me. 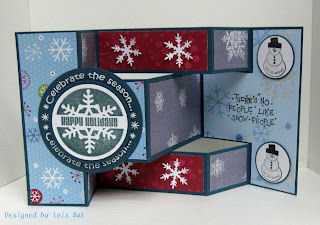 The main snowflake is from Just Rite Stampers’ 3 ¼” Christmas Stamp Ensemble – the center stamped on White and the outside stamped on Not Quite Navy. Both are cut out with Nestabilities circles. I added a few punched-out snowflakes to the red panels. The little snowman is a clear dollar stamp from either Michaels or Joann (not sure which), and the Snow People sentiment stamp is from The Artful Stamper. Red, blue and gray may not be traditional Christmas colors, but I’m happy with the way this turned out. Sometimes you have to go outside the box – in more ways than one! Mark's Finest Papers Design Team is celebrating our FIRST Blog Hop! How could we make it a REAL celebration? How about giving away some Blog Candy? For your chance to win, visit and comment on each of the design team members' blogs today and tomorrow. Then, on Friday, a winner will be chosen from those who have visited all 7 blogs both days. The winner will receive 2 BRAND NEW Stamp Sets, 5 packages of Mark's Finest Papers and 5 Satin ribbons! And remember, Friday night will be the New Flourishes Release at Mark's Finest Papers! The winner will be announced on the Mark's Finest Papers Blog on Friday. 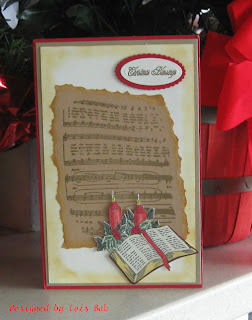 I had been looking for a stamp with Christmas sheet music on it when I saw Flourishes’ Christmas Music. I stamped the music with Palette Noir Black on Snow Storm Smooth cs and matted the panel in Egyptian Gold and Ripened Tomato. After scoring the large white panel using my Scor-Pal, I sponged Palette Moulin Rouge around the edges, and then matted it with gold and placed it on the red cardbase. I was so happy to see that Flourishes’ Fancy Labels matched some of my Spellbinders labels dies – this one fits very nicely into Labels Four. I added some pretty satin ribbon and a drum charm. The paper, ink, charm, and Flourishes images are available at Mark’s Finest Papers. 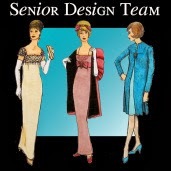 Mark's Finest Papers Design Team is celebrating our FIRST Blog Hop this week! How could we make it a REAL celebration? How about giving away some Blog Candy? For your chance to win, visit and comment on each of the following design team members' blogs on Wednesday and Thursday, December 9th and 10th. Then, on Friday, a winner will be chosen from those who have visited all 7 blogs both days. The winner will receive 2 BRAND NEW Stamp Sets, 5 packages of Mark's Finest Papers and 5 Satin ribbons! And remember, Friday night will be the New Flourishes Release at Mark's Finest Papers! The winner will be announced on the Mark's Finest Papers Blog on Friday. Good Luck! Hope to see you on Wednesday and Thursday! 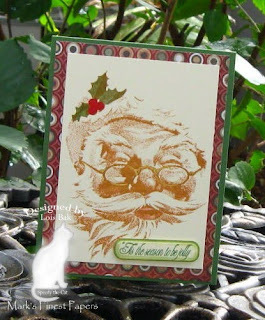 Today I have another card I made during my stamping week at the beach -- another Santa card using my very favorite Santa image – Flourishes' Santa I Believe set. I hate to add too much to this marvelous face so I just stamped it in Palette Cognac and colored only the holly and berries. I did outline the glasses with a gold Spica glitter pen. The card base is Spring Leaf, with a relatively wider mat of Basic Grey Wassail. The sentiment is stamped in Palette Landscape and cut out using a Spellbinders Label. All cardstock, ink and Flourishes images are available at Mark’s Finest Papers. My stamping buddy Rosemary and I take an annual trip to the beach each year right before Christmas. Her daughter has a 4th floor condo in Satellite Beach, FL which looks right out at the ocean. We pile all our stamping supplies into her SUV, take off for the beach, and then spend the week making our Christmas cards. Last week was our third trip – nothing to do but stamp, eat, and look at the ocean! These are some of the cards I made this week. I am loving this Flourishes set – Doves and Holly. 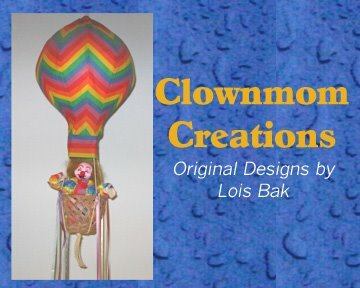 I made two cards using it. The first one is 5 x 6 ½ inches. The base and background panel for the doves are Ivory Cream Super Smooth. I cut the frame from Spring Leaf using the Spellbinders Foliage Frame die. I must confess I do not know where the DP came from – it was in my stash. The doves are colored using Copic markers, cut out, and popped up on dimensionals in the center of the frame. I added some paper piercing around the inside of the frame, and I was done. The smaller card is a standard A2 size. I thought the smaller doves would fit well using the double embossing technique, and I liked the way it turned out. Paper is Ripened Tomato and Snow Storm Smooth. This one is pretty simple – just the embossing, some ribbon, and a fancy tag. 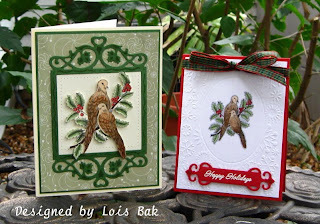 The cardstock and Doves and Holly set are available at Mark’s Finest Papers. 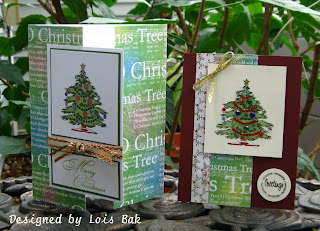 The tree on these two cards is part of a two-stamp swing card set from Repeat Impressions. The larger card is a gatefold card on which I glued DP from a big Christmas stack of paper from DCWV all the way to the edges of the “gate.” The tree is colored using Copic markers and some Spica glitter pens. I added a sentiment from My Sentiments Exactly and some ribbon. The smaller card has a little more bling. All the decorations on the tree are rhinestones from Michaels. The card base is Bravo Burgundy with a couple of stripes of DP added for interest. The little circular sentiment is from a clear dollar set. To say that my week at the beach was productive is probably an understatement. I wound up making around 35 Christmas cards. And we had a ball! We even had time to go see “New Moon” again for the third time! 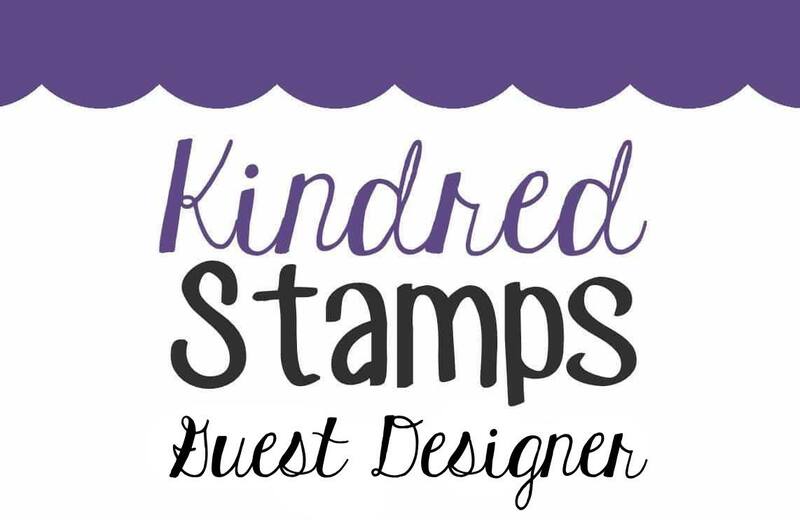 Nicole is this week's hostess for the Stampin'B's DT Blog Challenge. I took her literally when she said to do a “clear acetate window” card. I put an acetate window in my toy store. Art Impressions has a great series of stamps called Doorways. There is a door stamp and a window stamp. Then there are many different “theme” sets. This one is called Christmas Toy Shoppe. The lamp post is from the Bakery set. I stamped the door and window onto Very Vanilla cardstock with Palette Burnt Umber, colored them, and then cut them out. I paper-pieced the awning over the window. The cornice at the top and the sidewalk are Sahara Sand. I stamped the Christmas lights with Palette Noir Black across the cornice and colored them with Spica glitter pens. The sidewalk is stamped with Palette Burnt Umber. The storefront is a piece of Basic Grey Eskimo Kisses DP on which I stamped the window and then cut out the opening to place the acetate window behind it. The piece of Close to Cocoa matting is also cut for the opening, as is the Kraft card base. Inside the card is the image of the toys, stamped on Very Vanilla and colored with Copic markers. The lamp post, sign on the door and bench are all popped up on dimensionals. This was a fun card to make. Thanks, Nicole, for the push.